HAIFA – The Filippino community of Haifa observed its Patron Saint Day St Lorenzo Ruiz on 11 October 2014. Observed usually on 28 September, the celebration, chaired by Mgr Marcuzzo, Patriarcal Vicar in Galilea, was put forward for calendar reasons. The Latin Church of Haifa, which is wide enough, could hardly absorb all the Filippinos present – estimated at around 400 – coming from all neighbourhoods of Haifa. Fr. Abdo Abdo, OCD, is in charge of the parish, assisted by Sr. Michael Banquil, Filipino, of the Sisters of the Holy Family in Nazareth. Mass gathered as well Catholics from India or Sri Lanka. Filipinos have a deep-rooted veneration for this frist Filippino saint, who fell martyr in Japan in 1637, beatified in 1981, canonized in 1987 by John Paul II. The Bishop expressed his joy to stand among this community of immigrants who, as all other similar communities, do not lead easy life. He was commenting on the Sunday Gospel : “ guests at the banquet and the marital gown”, with reference to martyr St. Lorenzo and to the situation of immigrants. The Bishop drew attention, during his homily, on the communiqué issued of CELRA (Conference of Latin Bishops in Arab Countries) meetings, just terminated at the United Arab Emirates, during which one point was stressed, namely on immigrants, a large number living in these oil rich countries. Following Mass, news about communities were exchanged during meals. 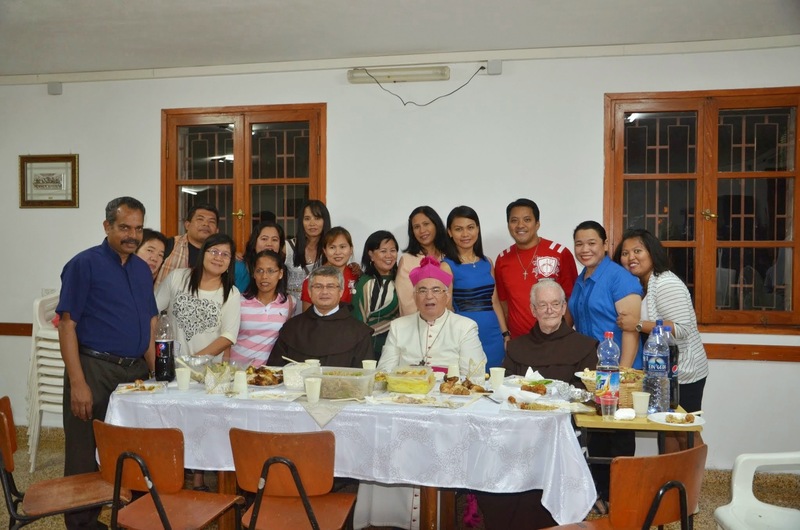 Mgr Marcuzzo announced the creation of a new Filipino community in Nazareth, gathering immigrants of the area, of Afula more particularly. It is a tiny community – usually they are about 25 and on special occasions they come up to 50 – who meet every Saturday at the Franciscan Church of “Mensa Christi” in Nazareth, accompanied by Filipino Sr. Elena Balsomo, SMC, and for Mass celebration, by Frs. Marco Cosini, pfjc, Jean Marie Boucary, mc, and Jordan Sesar, OFM. No fewer than 40 000 Filipinos live in Israel, mostly in the centre of the country, in the area of Tel Aviv and around Haifa. Their situation, more or less normal, is perhaps easier than that of other groups of immigrants, but however remains hard. Church strives to take best care of them. Results – praise the Lord – are too obvious, for there are as well religious vocations, even contemplative, originating from this Filipino community. We know that Fr. David Neuhaus, SJ, episcopal delegate for pastoring immigrants, exerts lots of efforts from his side to coordinate pastoral work among the different groups in Israel.